This PR was prompted by a Shop Importer that I am working on. I would like to leverage the inviteShopOwner code which creates an account, a new shop, kicks off emails, etc., but currently creates a shop with a copy of the Primary Shop (e.g., the name is "Reaction Shop 1"). As far as testing goes, there should be no impact on current functionality since there are no UI changes. 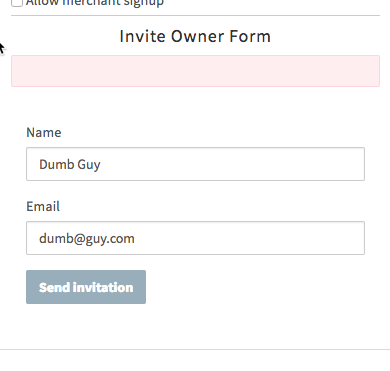 Server code can now call inviteShopOwner with both user data and shop data: Meteor.call("accounts/inviteShopOwner", userData, shopData). There is a test to show how it might be used. this is not necessarily related to this change, but I coded an error by mistake and this test was still passing. all other changes are in support of this tiny change! the changes from here on add extra null-checking/default value setting. I changed them to make tests less verbose (which is typically is a bad reason for changing code! ), but also figured extra null checks are never a bad thing. Previously, shopData.name would get a number appended regardless of whether the shopData is a clone of PrimaryShop or passed by the calling function. Now, this only happens when Primary Shop is cloned. the changes from here add extra null-checking. I changed them to make tests a little easier to write (which is typically not a great reason for changing code, I know! ), but also figured extra null checks are never a bad thing. new test was failing on this line, where group was null. While I don't understand how similar tests were passing, an extra null check can't hurt. You don't actually need the done/return done() here. A lot of test authors don't seem to understand it so I see why you would include it (that's what the other tests in this file do), but it's only needed when testing asynchronous methods and included in the callback. @aldeed does the new Simple Schema provider richer error messages when things like Match.OneOf, Match.Maybe, or Match.Optional fail validation? The messages when you check against a schema directly are super useful. I've had to change the validation when these fail to find out what's really going on, then change them back. Not the end of the world, but would prefer not to have to do that! @pmn4 Hey Pat, is this ready for re-review? do you have a process for re-reviewing PRs, or should I @ you when I am done making changes? Note that I have some significant changes to this in #3331, which most likely will be merged before this PR and require some conflict resolution. My changes include letting Mongo/Meteor generate the _id as you mention. when testing for errors not thrown, it is a good idea to remove the limitation on type of error. @zenweasel fixed a merge conflict, but otherwise, nothing has changed in the past few days since I addressed your comments. let me know if you have any other questions. @reactioncommerce/community can we move this PR forward for 1.9, shepherds needed..
@pmn4 Hey Pat, thanks for your patience with this. If you can fix up these conflicts (I tried but they didn't seem obvious to me) I will make sure and get this review and hopefully approved today. @pmn4 If we could get these conflicts resolved that would be great. I tried again today and there's a couple around brandAssets I couldn't make the call. If we could get those resolved we should be able to move forward quickly. @pmn4 Sorry Pat, we need to get the conflicts resolved again. i tried (again) and it got too dodgy. @pmn4 Can we get the conflicts on this resolved? I don't see any other thing that's holding us up. When I invite a new shop owner I get this empty error message and no shop is created. ah! sorry for wasting your time @zenweasel. I had been testing on an instance with a "cleaner" primary shop. the "taxes" in Shops.json violates the Shop schema. I will address that in a separate PR.